” We are surrounded by negative images of Aboriginal men and fathers. In the mainstream media, and even academic literature, they are mostly portrayed in a negative context: the focus is on crime, domestic violence, alcohol and other drugs, unemployment, and child abuse. It is time we started seeing more of the positives. 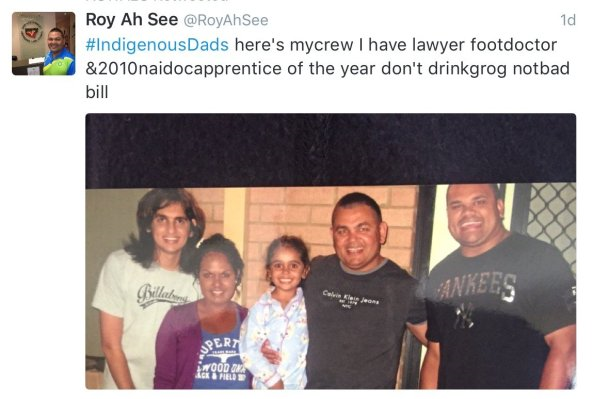 “As the spontaneous expression of Aboriginal identity and pride of #IndigenousDads demonstrated, Aboriginal fathers are teachers, lawyers, academics, employers, actors, animators, athletes. Above all they are dedicated and devoted role models for future generations and give them hope that they can rise above discrimination and racism, be proud of their identity and culture, and be encouraged to reach their potential. Working with Aboriginal and Torres Strait Islander communities in Newcastle, the Tiwi Islands, Yarrabah, Wreck Bay, Alice Springs and Hobart helped develop a series of beautiful posters that show Aboriginal and Torres Strait Islander in a different light. The article (available online from the publisher at a cost of $3.98) includes discussion of the ways in which he engaged local communities. 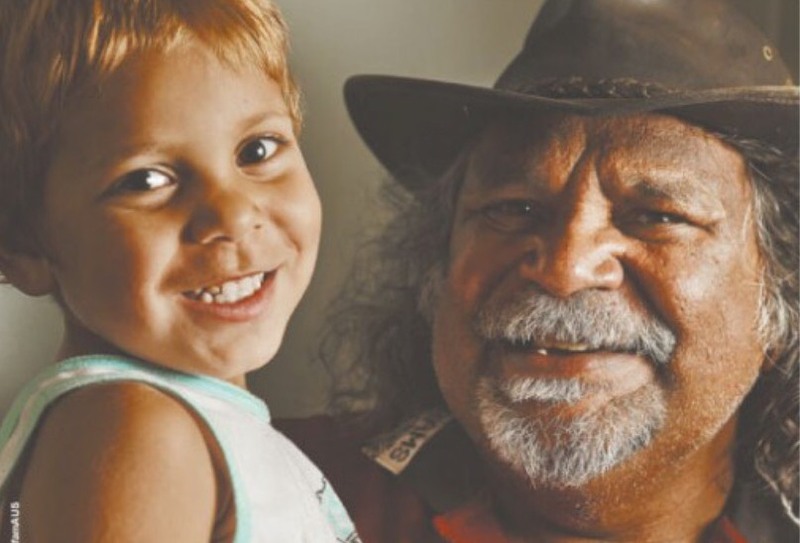 You can read about other work with Aboriginal fathers (for free) in the report Reaching the heart of Indigenous families & communities. Chris Sarra spoke about his work as a principal at Cherbourg School it showed the power of changing how we see Aboriginal people and communities. Despite wide spread negative perceptions about Aboriginal students, he knew they could be Strong and Smart (the school motto). Unfortunately not all the staff agreed. It was only when he had staff who really believed in the potential of their students that things could change. These types of negative perceptions are reinforced by the negative images that surround us. We need to to be exposed to more positive images of Aboriginal families and communities and to hear more from people like Chris and Craig who recognise and build on their strengths. Stuart, G., May, C., & Hammond, C. (2015). 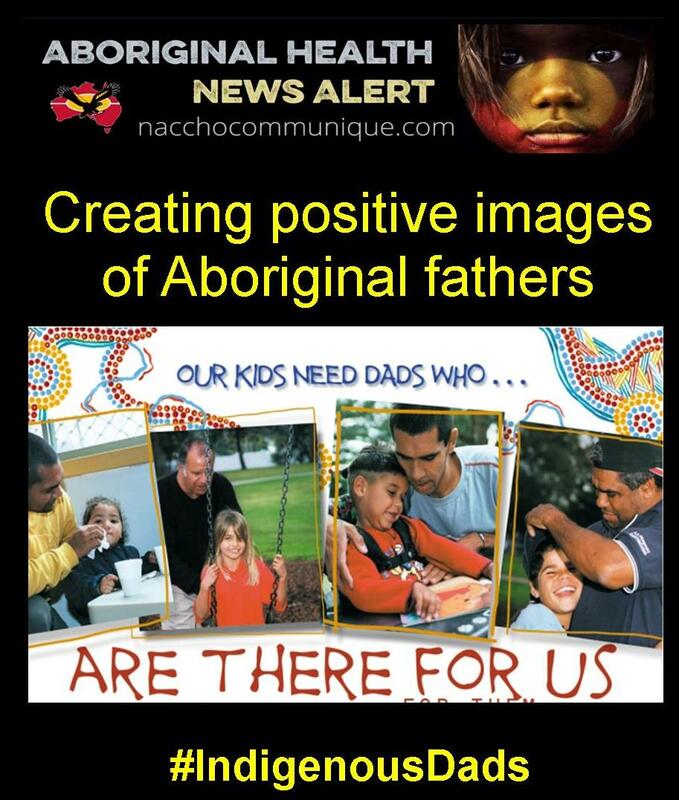 Engaging Aboriginal fathers. Developing Practice: The Child, Youth and Family Work Journal (42), 4-17. Some of the participants said that, at times, they found trying to engage Aboriginal fathers frustrating, challenging and plain hard work. A common challenge was creating or maintaining the momentum. Some participants felt that fathers tended to not do anything “until it gets to some sort of a pressure crisis point.” At times this meant that a problem had escalated to the extent where services were limited in the support they could provide and the fathers were unsatisfied with the response. This made further engagement less likely. Sometimes, by the time the worker could make contact, the crisis had passed and the father no longer wanted assistance. Participants also described how they would establish an effective group for a while but numbers would dwindle off. Attendance could be spasmodic or decrease for a range of reasons – many of which were external to the program. Most participants in this research were female and/or non-Aboriginal, and this was clearly a challenge for some of them. Whitney: I think the thing that’s lacking is just that male presence. Just thinking of the three meetings that we’ve got set up. We don’t even have men on the planning side of things, so that’s – we could start there…. While it was not discussed to the same extent as being male, some of the workers discussed the challenge of not being Aboriginal. As one women suggested ‘it’s ideal if you’re black and hairy’, that is, visually clearly both Aboriginal and male. Part of the challenge was in knowing the best way to respond to male Aboriginal culture. At times there was a problem being outside the culture and receiving conflicting advice from different people. One way in which Jennifer attempted to address this issue was by using Aboriginal trainees; however many of these trainees were challenged by limited knowledge and experience. Time and funding structures could also become a major constraint for service providers trying to build meaningful relationships with Aboriginal fathers. A male participant, who had extensive experience with a variety of services, found that funding agreements requiring a certain number of clients meant that he didn’t have the time to build and maintain relationships with quite marginalised fathers. Others spoke about the time required to become accepted, particularly when they were not part of the local Aboriginal community. The service providers identified a range of strategies that they had used to engage Aboriginal fathers. Participants frequently spoke about the importance of building strong, trusting relationships with Aboriginal fathers. Jo suggested that relationships were particularly important when working with Aboriginal communities. It often took time to build trusting relationships and participants spoke about involvement in the local Aboriginal community and using non-work contexts as a means to help build these relationships. If I see someone up the street I’ll never ignore them, ‘Good day mate, how are you going?’ And then I’ll say, ‘No, just doing my shopping. Give me a call Monday morning mate. Come in and see me’ because I don’t, I can’t lower those boundaries… I don’t want to have to go to the shops and have to deal with a client; my life is very separate to my work. Aboriginal workers who worked in the same community they lived in were under particular pressure. In terms of the importance of gender and Aboriginality, many of the participants felt that these factors needed to be taken into account in service design. They described how people coming to a service might want to see a male staff member and how having male or Aboriginal staff encouraged Aboriginal fathers to become involved. Where having Aboriginal male staff wasn’t possible, an alternative was having somebody who was known to, and accepted by, the local Aboriginal community. Services with only female staff (often projects with a sole worker or only a few staff) sometimes tried to find men who could take a lead role or worked in partnership with other services who could provide a worker who was male, Aboriginal or both. Participants also spoke about the importance of creating a father-friendly environment. An important starting point was the physical setting (colours, posters, reading material). One of the more frequent strategies employed to engage Aboriginal fathers was the organisation of specific events and activities. 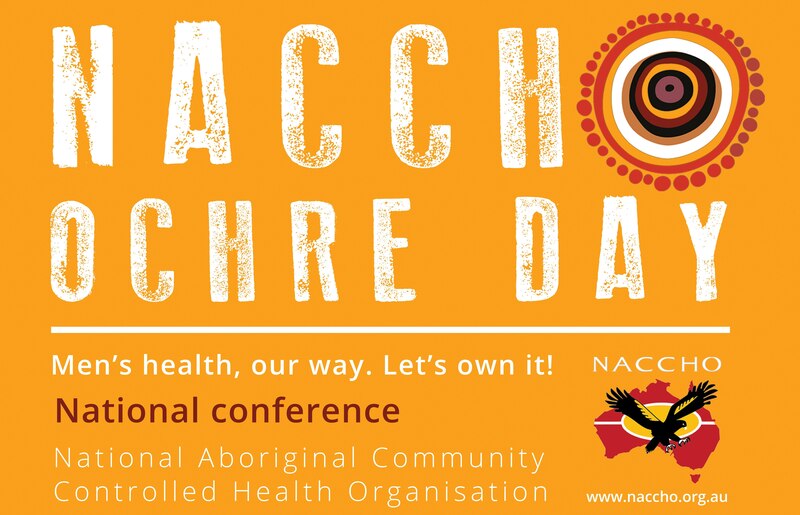 For example, NAIDOC (National Aboriginal and Islander Day Observance Committee) week was often seen as a good opportunity to engage Aboriginal fathers. However, relying on these one-off events may not be enough. As one person said, ‘You can’t continually have these big celebration things.’ Fathers would come for the special events but not continue their involvement with the organisation afterwards. Most of the male participants in the focus groups had been involved in running camps for Aboriginal fathers and saw them as generally being successful in both engaging fathers with the service and in the lives of their children. Cultural activities were also seen as a particularly good way to engage Aboriginal fathers. Focus group participants identified the importance of recognising gatekeepers and ensuring they were supportive. Mothers and other female family members could play an important role in facilitating the engagement of Aboriginal fathers in a service and with their children, particularly in relation to their role as a gatekeeper to engagement with the children. Services needed the support of these important family members. In Aboriginal communities, elders frequently play a vital role in engaging other community members. Gaining the support of elders could be quite beneficial for services. Flexibility was important in a range of areas including the hours of operation, location and way of working. Participants also suggested that it was important to be flexible in terms of group membership so that extended family could be involved. Finally it was important that participants had a sense of ownership of the programs. The present study identified a number of issues which need to be considered in developing strengths-based programs for engaging Aboriginal fathers and fathers of Aboriginal children. The strategies identified by the participants in this research offer suggestions for ways to address these issues. It is important to note that our paper is grounded in the specific context of Aboriginal fathers in urban Newcastle/Lake Macquarie and the more rural setting of the Upper Hunter Valley. Despite the Hunter region’s history of colonisation, with the first European settlements being established very early in 1800s, and the major impact of oppressive, divisive and discriminatory policies, there is still a very strong sense of culture and identity within local Aboriginal communities. While some of the findings may be relevant to other contexts, there may also be differences. 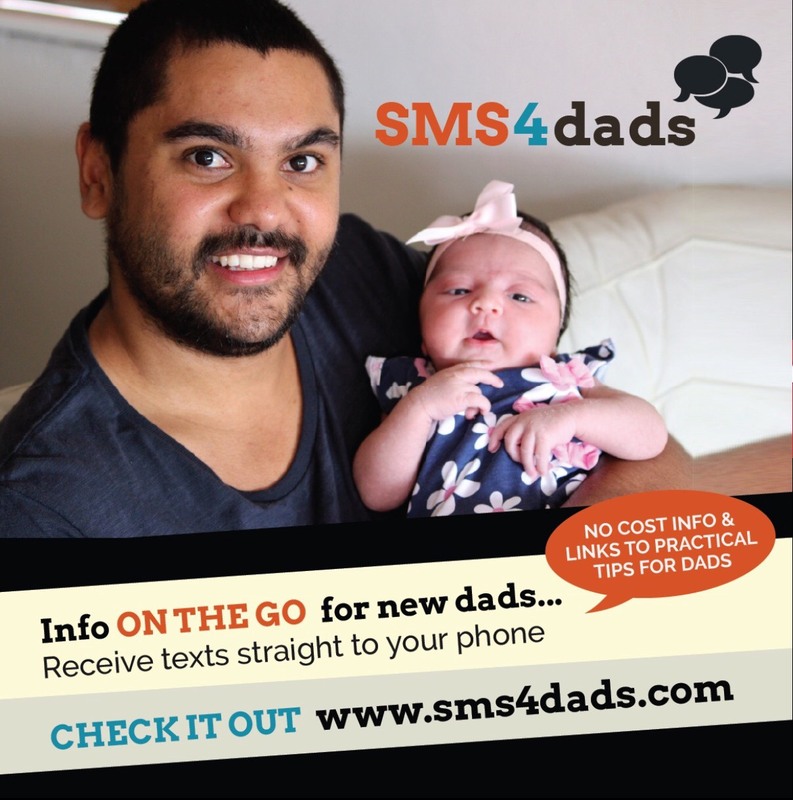 The experience of Aboriginal fathers in regional NSW context will be very different to Aboriginal fathers in other contexts such as remote communities. Despite these differences, there are also likely to be similarities. A key learning from this research is the need to carefully build strong and trusting relationships before meaningful intervention can begin. Urban Aboriginal men have often moved to be with their partners and therefore their family and community connection are in other communities. This means they may be poorly connected to the community in which they live. Many will also experience distrust that has arisen from factors such as colonisation, cultural disconnection, family disruption and intergenerational trauma (Bowes & Grace, 2014; Lohoar, Butera, & Kennedy, 2014; Secretariat of National Aboriginal and Islander Child Care, 2010). Building connections with these men requires both skill and credibility, particularly as the men often seek informal references from people they know within the community before engaging in any form of relationship with a service’s staff. Having male Aboriginal workers within the program has the potential to minimise barriers such as these and to reduce the risk that an engagement will fail before it has begun. The value of having Aboriginal male workers has been emphasised in previous literature (Beatty & Doran, 2007; Berlyn, Wise, & Soriano, 2008; Communities and Families Clearinghouse Australia, 2010) but, as identified by participants in this research, this can be difficult for sole-worker service or services where all the staff are women. Services can address this by strategies such as adopting partnerships with Aboriginal workers, employing local Aboriginal men on a casual basis and recruiting well supported male volunteers. Mothers, and their families, play a key role in managing the lives of children in urban Aboriginal communities (Secretariat of National Aboriginal and Islander Child Care, 2010). Mothers are more likely to talk to teachers, attend services and provide a greater proportion of care to their children. If mothers are sceptical or anxious about a program then it is unlikely that fathers will be encouraged, or given permission, to attend (Tehan & McDonald, 2010). A key tenant of a program’s success may therefore lie in the ability to win the confidence and support of mothers. One strategy to manage maternal concerns is to operate programs out of services that mothers know and trust, and to incorporate the involvement of workers that have previously formed trusting relationships with the mothers. Like fathers in other communities, Aboriginal men often rely on signals that a program is going to focus on their needs rather than fit them into a program designed for mothers. This may particularly important for Aboriginal men because of highly differentiated maternal and paternal parenting roles that characterise many Aboriginal communities (Department of Families, 2009; Secretariat of National Aboriginal and Islander Child Care, 2010). Programs should therefore aim to create environments that explicitly welcome men and signal to them that they are in a man’s space (Berlyn et al., 2008). Programs should also aim to focus their activities on factors that relate to fathering roles in Aboriginal communities such as culture and connection to community. One means of doing this is to link fathering activities with well-established cultural events. A program, however, needs to create more opportunities than those afforded by these intermittent celebrations of harmony or culture. Holding camps where fathers can engage with their children around cultural activities was identified as an important way to fulfil many of these requirements within a program (see also Communities and Families Clearinghouse Australia, 2010). However, it was also recognised that programs needed to actively engage with, and manage, potential maternal concerns that could easily arise from such activities. 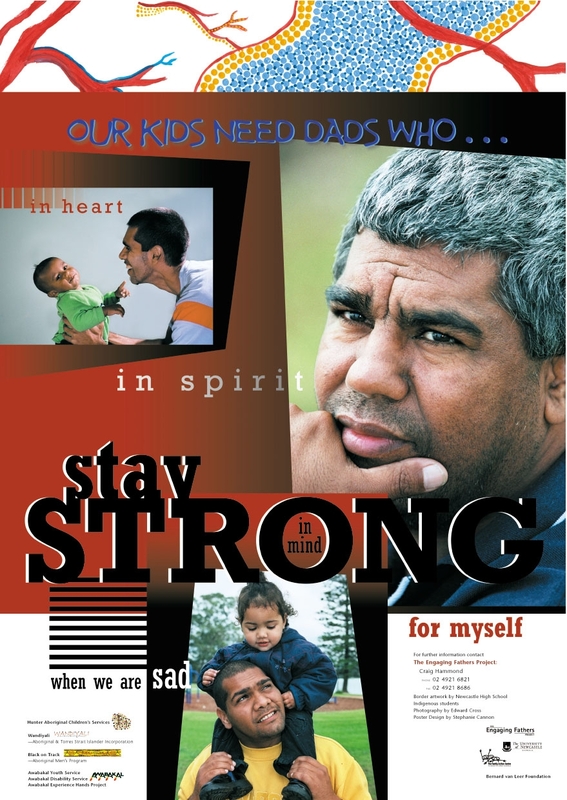 Strengths-based approaches to working with fathers and Aboriginal communities are important in challenging some of the negative, disempowering approaches that have often been adopted when working with Aboriginal communities. Lohoar, Butera, and Kennedy (2014) argue that Aboriginal cultural practice and cultural identity is a strength that ‘acts as a protective force for children and families’ (p. 2) and a range of authors have advocated a strengths-based approach to working with Aboriginal families and communities (Armstrong et al., 2012; Bamblett & Lewis, 2006; Geia, Hayes, & Usher, 2011; McMahon, 2003; Secretariat of National Aboriginal and Islander Child Care, 2010). Recommendations developed from the present study are therefore strongly grounded in strength-based approaches that have the potential to empower urban Aboriginal fathers to develop, strengthen and reclaim relationships with their children and families.